Whiskey History: What is White Dog? White dog goes by a few different names: white lightning, light whiskey, white whiskey. No matter what you call it though, it’s the basis for all American whiskey. As it comes off the still, all whiskey is essentially white dog. To be sold as white dog (or any of it’s other names), this un-aged, raw whiskey isn’t required to spend any time aging before it’s bottled. 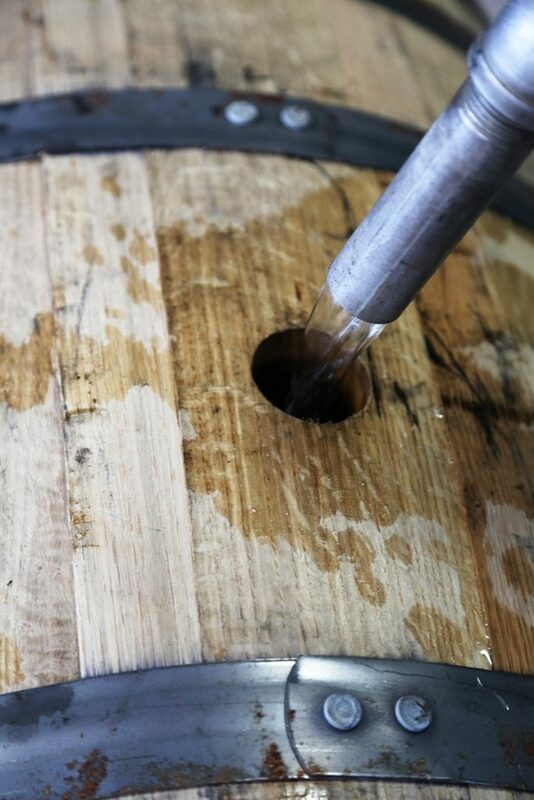 While water is usually added to dilute the alcohol content, it spends no time aging and absorbing flavor from barrels. And if you’ve ever tasted white lightning, then you know exactly what the value of barrel aging brings to whiskey. So the bottles of white dog you see for sale in stores? Yep, those are simply full of raw, un-aged whiskey, or what the moonshiners would have probably just called hooch. The spirit has never seen the inside of a barrel. Our mash bill is 72% corn, 18% rye and 10% barley, but like all whiskeys, the majority of our whiskey’s flavor comes from the barrel. And in our case, we’re not content to simply use charred new white oak barrels. That’s why we finish all of our whiskey in port wine casks. White dog is an important part of the bourbon process, but we can’t imagine why anyone would want to enjoy a blank canvas.